Children at Robinson Gardens Apartments got an early start on celebrating the late civil rights activist Dr. Martin Luther King Jr. Gathering in the Community Room in the Springfield Housing Authority Development in the Pine Point section of the city, 10 girls and boys first discussed the life of the American Baptist minister who became the foremost spokesperson and leader of the civil rights movement in the late 1950s and into the 1960s, when he was assassinated in Memphis, Tennessee. Tree of Peace created by Robinson Gardens Apartments youth in honor of Martin Luther King Jr. Day. King died on April 4, 1968, shot while standing on the balcony of the Lorraine Motel in Memphis, where he was visiting to support African-American sanitary public works employees who were on strike at the time. At Robinson Gardens, discussion included details of Dr. King’s life, with a focus on his work promoting civil rights for African Americans, first in his hometown of Atlanta, Georgia, and later across the country. He delivered his ‘I Have a Dream’ speech in 1963 in the ‘March on Washington’ which he helped organize. Children discussed their own experiences with regards to civil rights, with two talking of experiences related to being bullied. Each child made a paper dove to symbolize peace, and then each wrote a reflection on ‘My Dream for the Future.’ Writing prompts were ‘My Dream is…’, ‘My Dream for My Family is…’, and ‘My Dream for the World is…’. 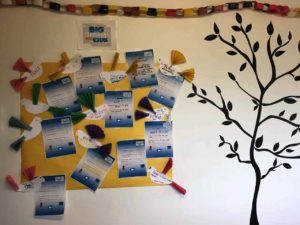 Each child hung their writing and their dove onto the wall of the Community Room. Another activity with the group was individually making a paper chain which were then all connected them together to make one chain. The various colors stood for all people joining together for freedom and peace. The event was sponsored by the Talk/Read/Succeed! program at Robinson Gardens and two other SHA developments, to help promote early literacy and support families. The other two participating developments are Duggan Park and Sullivan Apartments. Robinson Gardens Apartments youth with Talk/Read/Succeed! Program Coordinator Lynne Cimino in front of the Peace Tree they made for MLK Day. Lynne Cimino, T/R/S! program coordinator at Robinson Gardens, said the children who attended proved to be thoughtful and enthusiastic, discussing and reflective at length about Dr. King’s contributions to society. 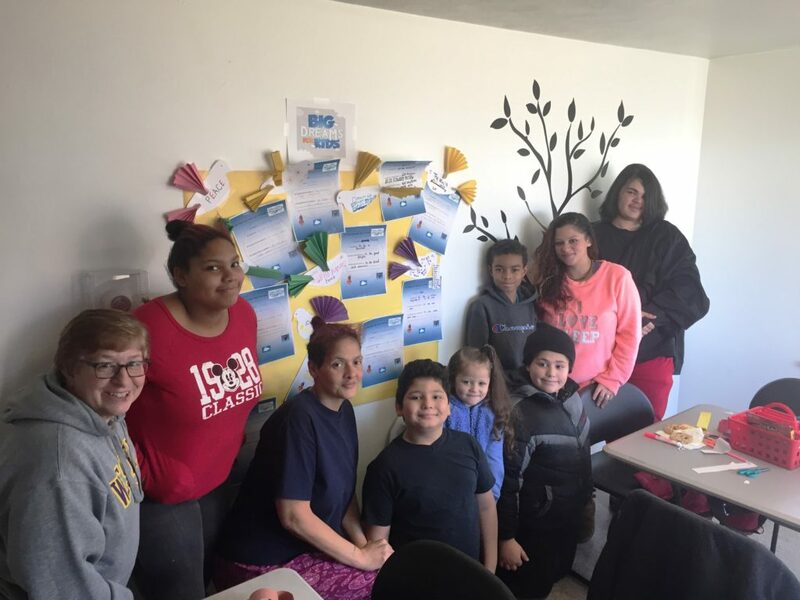 “It was a fun afternoon together, spending time together and talking about their dreams,” Cimino said. Martin Luther King Jr. is remembered each year in a national holiday, held on a Monday near his January 15 birthday. This year, MLK Day is Monday January 21. 99 days ago / Talk/Read/Succeed!